Canadian researchers lead the way in understanding the neurological, psychological and cognitive basis of music. In his second floor office at the Neuro (as the institute’s known to those who work there) on a muggy day last June, neuroscientist Robert Zatorre scans his book shelves for one of Dr. Penfield’s classic articles, the 1963 paper, “The brain’s record of auditory and visual experience: A final summary and discussion.” Dr. Zatorre leafs through the monograph and stops at a page with a line drawing of the human brain dotted with dozens of points clustered along the right superior temporal gyrus – a lobe of neurons behind and above the ear. “It’s a summary of all the areas where patients heard music when their brains were stimulated,” says Dr. Zatorre. Over the course of hundreds of brain surgeries to relieve patients’ debilitating seizures from 1934 to 1961, Dr. Penfield the neurologist and brain surgeon used a pencil-tip-sized electrode with a mild current to gently stimulate different areas of patients’ brains, noting what they experienced, from smells to sights to intense feelings and sounds. When Dr. Penfield ever so gently zapped Case 4 – lying on the operating room table, the top of her skull cut away to reveal her brain – she described clearly hearing White Christmas. Case 31 heard Mendelssohn’s The War March of the Priests and Case 37 heard an inner band strike up a song from Gershwin’s Guys and Dolls. These patients clearly had music hard-wired into their brains, with even the correct rhythm and timing, Dr. Penfield noted. “What’s cool is, if you fast forward 40 years, we now have the tools to actually study this experimentally with brain imaging,” says Dr. Zatorre, a world pioneer in using neuroimaging to watch how our brains groove to, sing along with and enjoy music. When Dr. Penfield published his landmark account of the functional localization of music in our brains, there was nary a psychologist or neuroscientist studying music and the mind. Now, after the recent 50th anniversary of Dr. Penfield’s article, music in its myriad forms has emerged as a primary instrument for exploring our essential natures – no brain surgery needed. And during the past 40 years, it has been Canadian researchers who’ve been global leaders in creating this hot new field (see sidebar, “On the origins of a new science,” below). With Montreal as its nerve centre, a network of well-funded Canadian institutes has emerged as publication powerhouses and graduate-student magnets, including those at McGill, Université de Montréal, Ryerson University and McMaster University, creating a dynamic Canadian music and mind research scene. 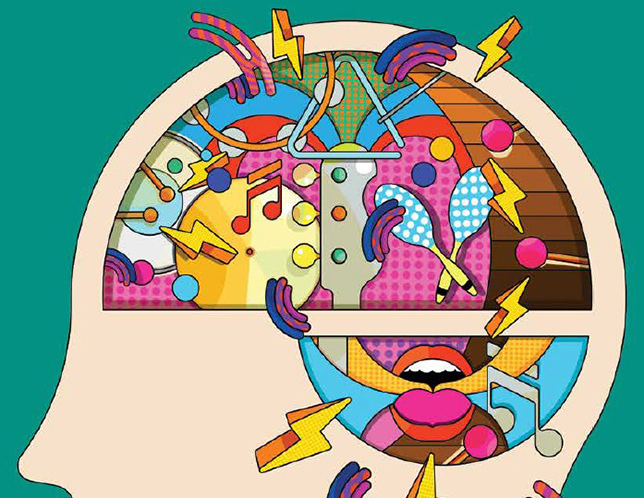 Half a century after Dr. Penfield’s initial observations on our brains’ musical nature, music and mind researchers say it appears there’s in fact no better tool than music for teasing out the subtleties of what makes us tick. Music is one of the few universal cultural traits, on a par with language, and most scientists think it’s unique to Homo sapiens (not withstanding bird song – “more akin to language,” says Dr. Zatorre). Brain imaging studies have revealed that Dr. Penfield’s probing discovered one part of a much larger whole. It turns out that music provides a unique window into the networked complexity of our minds. “Music is represented all through the brain, there’s no music centre,” says Queen’s University’s Lola Cuddy, a music psychology pioneer. This distributed musical neural complexity happens in part because music is much more than sound. Music and mind researchers are exploring music in relation to movement (McGill University’s Daniel Levitin notes that in most cultures the word for music and dance are the same), vision, memory, language, its emotional resonances and its genetic and evolutionary basis. And they’re stripping music down note by note to understand the nitty-gritty of what moves us. Such is the case at McMaster University’s MAPLE lab (Music, Acoustics, Perception and LEarning), the world’s first music and mind lab focused on percussion. “I’m pretty sure we’re the only psychology lab in the world with a marimba,” says MAPLE’s founder and director, psychologist Michael Schutz, also a professional percussionist who leads McMaster’s percussion ensemble. But, says Dr. Schutz, it’s what’s seemingly obvious that’s providing a new route to understanding the complexity of sensory integration in our brains. For example, in a previous study, Dr. Schutz revealed that a marimba performer can create an auditory illusion. Even though every note on a marimba has the same duration regardless of how the key is hit, Dr. Schutz showed that by using either quicker or slower movements, a percussionist can make listeners perceive they’ve heard a shorter or longer note. “It sort of blew my mind realizing how the visual information is really playing an essential role in the whole musical process,” says Dr. Schutz. “What I found there flies in the face of all the literature on audiovisual integration.” Previously, it was thought that auditory acuity was universally sharper than visual acuity. In early 2013, Dr. Zatorre and then doctoral student Valorie Salimpoor (now at the Baycrest Health Sciences’ Rotman Research Institute in Toronto), reported in Science a study clearly linking music, emotion and neurotransmitters. Using neuroimaging, they watched as study participants’ brains released the key pleasure-related neurotransmitter dopamine several anticipatory seconds before the peak emotional crescendo of music they liked, a milestone in the cognitive neuroscience of music. On the opposite side of Mount Royal from Dr. Zatorre, Isabelle Peretz is exploring how we’re wired for music by studying the least musical among us. Dr. Peretz, a cognitive neuropsychologist at Université de Montréal, has pioneered work in amusia. Previously called “tone deafness,” Dr. Peretz coined the term amusia to describe the two-in-a-hundred of us whom, she’s discovered, aren’t just bad singers but are born without some essential biological chops. Dr. Peretz is based at BRAMS, the International Laboratory for Brain, Music and Sound Research, which she co-founded with Dr. Zatorre in 2007. Sandwiched between the Mount Royal cemetery and leafy Outremont neighbourhood homes, BRAMS hosts about 100 international trainees, from undergraduates to postdocs, occupying the expansive second-floor wing of a former convent. Last year, Dr. Peretz’s group reported the first case of congenital amusia in a child, a 10-year-old Montreal girl referred to the researcher by a stymied but immensely patient choir director. The case built on Dr. Peretz’s landmark 2002 report on Monica, an intelligent, articulate 37-year-old Montrealer whom Dr. Peretz found through an ad that she had placed in Montreal papers looking for research subjects. “I had never seen a case like that,” says Dr. Peretz of Monica. “She was terrible. She couldn’t sing, she couldn’t recognize the melody of Happy Birthday, she couldn’t discriminate descending pitches.” Indeed, Dr. Peretz’s research has shown that it’s pitch discrimination, rather than keeping time, that’s at the core of amusia. Currently, Dr. Peretz is leading the global hunt for the first specifically music-related genes, which she believes could be linked to mutations in genes that encode for the formation of frontotemporal neurons in the brain. This gene-brain-music pursuit is fuelled by the 2001 discovery of the FOXP2 gene, the first linked to a heritable speech-language disorder. “It’s only starting,” says Dr. Peretz of the search for music-related genes. Her lab is currently working on the molecular analysis of DNA collected from one large family with multi-generational amusia. What’s changing, says Dr. Russo, is that music and mind research is slowly providing empirical research to underpin (or not) various music therapies, in turn rebranding them as “neurological music interventions.” This vision of clinical trial-style musical testing is part of what’s spurred the creation of the University of Toronto’s ambitious new Music and Health Research Collaboratory. Similarly, in March 2013, McGill psychologist and leading mind-and-music researcher Daniel Levitin (who recently announced he’s leaving McGill to become dean of arts and humanities at the Minerva Schools in San Francisco), co-authored the first large-scale literature review of the impact of music on health outcomes. Summarizing the findings of more than 400 scientific studies, the review noted that there’s clinical evidence that playing and listening to music can boost our immune systems and reduce stress – in fact, listening to music was found to be more effective than prescription drugs in reducing a patient’s pre-surgery anxiety. But it’s already clear that music can do far more than provide a calming balm: song and rhythm can rewire our brains to overcome brain damage. The most high-profile case is that of U.S. congresswoman Gabrielle Giffords. Shot in 2011 by an assailant in the left side of her skull, Ms. Giffords awoke from a coma unable to speak, but she could sing. Music therapists used a technique called melodic intonation therapy (often used with stroke survivors) to rewire Ms. Giffords’ language skills, using melody to shift her brain’s language centre from the left hemisphere to the right one. At Ryerson’s SMART Lab, Dr. Russo is hoping to leverage the neural links between music, movement and emotion to help emotionally kick-start Parkinson’s patients who’ve lost expressiveness. Researchers think the inability of Parkinson’s patients to physically express emotion in turn limits their ability to understand emotion. Dr. Russo is currently leading a research project in Toronto funded by Parkinson’s Canada that’s a kind of “air guitar” for emotions, using music to reignite Parkinson patients’ emotional expression. “We’ve become convinced that simulation is an important part of understanding emotion in music. Now we’re trying to use simulation in a therapeutic sense,” he explains. At the University of Western Ontario, cognitive neuroscientist Jessica Grahn is exploring how musical rhythm could act as a sort of musical walker to help Parkinson’s patients and others with movement disorders to improve their gait and balance. As mind and music researchers begin another half-century of research, they are learning that music is not only central to being human, but that for many of us, in the end, music might be all that’s left of us. Queen’s psychologist Lola Cuddy is presently leading a brain imaging study of Alzheimer’s patients to understand why, when almost all other aspects of mind are gone, the music plays on. The Stardust Revolution: The new story of our origins in the stars. The present crescendo of interest in music and the mind is a far cry from the scholarly silence on the topic in 1969 when Lola Cuddy set up Canada’s first proto music psychology lab at Queen’s University. “There was not much talk of the mind, and there wasn’t much talk of music … because it wasn’t something behavioural that you could measure like an animal running down a maze,” says Dr. Cuddy, Canada’s grande dame of music psychology, an emeritus professor at Queen’s and still leading a research lab. Music gained an academic toehold, she says, with the cognitive psychology revolution. Rather than a behaviorist approach focused on only observable physical behaviours, cognitive psychologists studied the brain as mind, those experiences going on inside our heads that can’t be directly observed, such as memory and feelings. It was a shift in perspective that profoundly changed the way psychologists saw music. “Everybody was seeing music as an art, as a cultural artifact that we really didn’t have to pay attention to,” says cognitive neuropsychologist and Belgian native Isabelle Peretz. In the early 1980s, she sidelined dreams of a career as a professional classical guitarist to begin to pick away at the psychology of music at Université de Montréal. In 2007, with $14 million from the Canada Foundation for Innovation, Dr. Peretz and colleague Robert Zatorre co-founded BRAMS, the International Laboratory for Brain, Music and Sound Research, now the world’s foremost such institute. Labs like BRAMS are combining the latest brain imaging and digital music technologies to give researchers unprecedented views of the interaction of our brains on music. The pioneering work of Canadian scientists “influenced an entire generation of students like me … to go into [the] field,” says via e-mail cognitive psychologist Daniel Levitin, recently of McGill University and best-selling author of books, such as This Is Your Brain on Music, that have brought the psycho-musical theme into public consciousness.